HEIDELBERG, Germany – I may be a week late writing about my night at the open mic in Jack Doyle’s Irish pub in Budapest, but there was no way I was going to let this one slip away. Budapest is not the greatest city for live music, unless you like double bass, guitar and violin players in chintzy restaurants coming up to your table and interrupting a deep and loving conversation. But open mics and open jams have become increasingly present compared to just six years ago when I started looking for them in Budapest in my around-the-world open mic journey. And about four years ago, maybe, I first found the Thursday night open mic at Jack Doyle’s, just off Vaci Street, and I’ve attended every year since. This is by no means a hugely successful open mic by the standards of the kind I often write and rave about on my blog. But it has been animated by the same MC – with the very cool voice and repertoire – since I’ve been going, and he is always accompanied by an excellent guitar player, this time being no exception. In fact, it was an exception this time in that the lead guitar player also suddenly decided to sing at one point, with the most amazing, unique bass voice! You have to hear it on the video. There are never that many musicians present, but there is a steady flow, and that means you can have a chance to do more than just the usual two or three songs at the mic, if you’re lucky. The bar staff is great, and what I’ve found incredibly, is that the clients of the bar are really happy to listen to music too. It’s not one of those Irish pubs where clients are present for anything BUT the music. So all in all, it’s an excellent night at Jack Doyle’s in my experience, and last week was no exception – it was, in fact, exceptional. I got to sing and play to my heart’s content, and the guitarist played along with me, adding much value. The rest of my weekend got derailed by personal things I don’t need to get into right now. Suffice it to say that I did not get to attend my other favorite open mic/open jam at the Szimpla Kert, but I know someone who did, and so I do know that it was still happening. I also heard that there were mountains of people waiting to get in this jam-packed beer garden complex in what looks like a squat. So it remains as popular as ever…. I’m now in Heidelberg, and so far so bad, in terms of live music. The university town decides to turn off for the summer…. But I will continue to explore…. I ended up at another Irish pub last night, and who knows…. Just a note to say that I have updated my Budapest open mic city guide, The Thumbnail Guide to Budapest Open Mics, Jam Sessions and other Live Music. I have added another open mic, a couple of open mic list links and several other links to fill out the page. 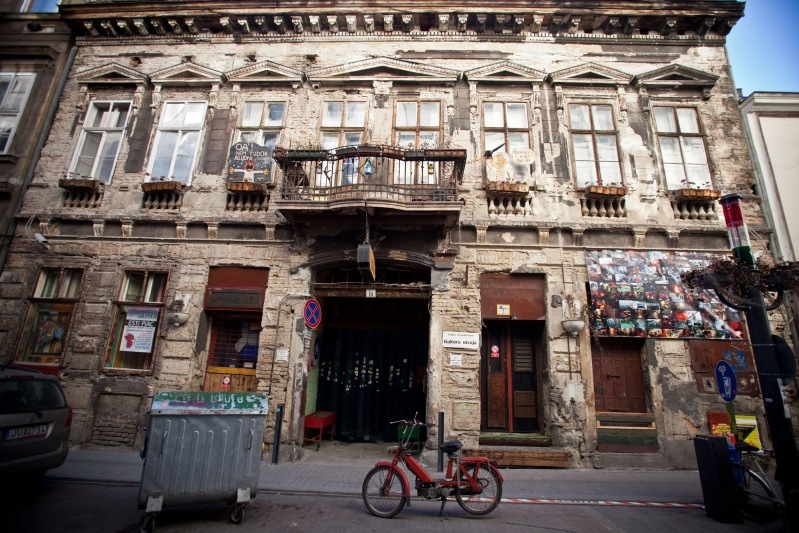 BUDAPEST – Timing was everything at the Szimpla Kert open stage in Budapest last night. I had only previously ever played in the open jam session at the Szimpla Kert on Sunday nights, but I had noticed this trip that there is an open stage on Friday. So, figuring it was another one of these open nights that starts around 9 PM and closes early, I decided to check it out before eating dinner. Good thing I did…. The Szimpla is a fabulous garden bar place that looks like a squat, and is made up of all sorts of different bars, rooms, chicha smoking areas, a recording studio, everything. It has always been one of my favorite places to go at least once while in Budapest, and it gets absolutely packed tight with thousands of people in the various mazes of the rooms and halls. The stage for the open jam and open stage is a wonderful, quite large, end-of-a-long bar room and last night there was a pretty sizeable and receptive audience, and a could of guys who were running it, jamming throughout. I showed up in time to get on the stage as the next performer and played a number of songs, with one of the guys accompanying me on bass and the other on a drum. The mic was great, so I enjoyed the singing. After my set, unfortunately, I had to make off pretty quickly to find a restaurant. Crossing the street from the Szimpla I immediately heard a gypsy band playing in a restaurant, and a crowd around the outside, in the street. I filmed a bit but did not go in there. Instead, I found a great little Hungarian food restaurant, a traditional one, a few streets over, completely abandoned of clients – all of whom wanted to get robbed paying for crappy food where the tourists congregated. After dinner, well before 11 PM, I returned to Szimpla, but as I expected, the open stage was finished already. During this time I had received some messages from Paris and the the Place Pigalle, however, hearing that Raphaëlle’s weekly Friday night open mic at the Noctambules bar was yet another fabulous one; one, in fact, it turns out that was among the best, with probably the biggest crowd yet. I regretted missing it, but it is not possible to be in two cities at the same time, unfortunately, since I love both Budapest and Paris…. But I’ll be at the Noctambules next Friday…(and thinking about Szimpla?!!). BUDAPEST – It was a real hot night at the open mic in Budapest last night, at Jack Doyle’s Irish pub. Unfortunately, I mean that literally! It was so hot – like around 37 or so inside the pub, and only a few degrees lower outside – that I think the usual open mic crowd got scared away. Well, that fell very much to my advantage in two ways. It meant that I could sit back and listen to a very long set by the duet that has hosted this open mic for a few years, and really appreciate their stuff. It also meant I could give them a big break and do a long set of my own, which lasted at least half an hour. The MC duet band at Jack Doyle’s open mic – first song. Oh, and of course, it also meant I could enjoy the cold Kilkenny even more than I usually do…. The MC duet band at Jack Doyle’s open mic – second song. Stay tuned for more hot stuff in Budapest! 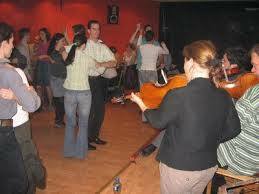 BUDAPEST – In yesterday’s post I said that open mics and open jams were not really much part of the culture in Hungary. I have to take it all back. Or, rather, I have to redefine what an open mic and open jam session is, and say that they are very much alive and well in Hungary. I stumbled into one last night in a kert in downtown Budapest, but this is strictly, totally, a Hungarian form of what my blog is all about. I heard the music from the street, violins, a bass fiddle, some smacking and stomping. So I entered the kerf – a beer garden of a kind that Budapest is full of, using mostly ruined buildings or the foundations where buildings used to be – and followed the sounds of the violins into a small sub-bar off the edge of the kert. There I saw a fabulous vision of three young guys in their 20s and a young woman in her 20s playing what sounded to me like Hungarian folk music. In front of them danced a man in a crazy body slapping dance I’d already seen in a completely different context. I took a beer and sat and listened, and when the band stopped, I decided to ask if it was an open jam session, even though I knew that if it was, it was strictly Hungarian traditional music. I asked the right violin player of the three present – the woman played the bass – because he immediately launched into an explanation of the entire history of the location AND the music, and told me what it was all about. It’s called a Dance House, and Budapest has five or six ones that run different days of the week, according to this violinist. The music comes mostly from Transylvania – yes, yes, Dracula and all that – and is part of a Hungarian and Romanian folk tradition that goes back hundreds, and even thousands of years. In more modern times, Bela Bartok, the great Hungarian composer, began collecting the music and preserving it, and soon the phenomenon of the Dance House, or Táncház, was born basically from the 1970s onward, in a Hungarian folk revival period. The musicians now get together to play this traditional music, they share the songs amongst themselves, and they play it in the many Dance Houses around the country. But it is essentially a kind of gypsy music played in villages. My interlocutor – who is a music student from Transylvania, by the way – told me that even the gypsies that play gypsy music in the cities do not necessarily know this kind of music, which is different. He said that in some villages the musical sessions usually at peoples’ homes Dance Houses and at weddings can go on for days on end, with dancers and musicians even taking shifts – going off to sleep while another group returns to celebrate. Last night several other musicians showed up, more and more dancers joined in, then some people began singing to the pieces, and for once I did not take my guitar out of my bag, but rather hit the dance floor and spun my partner round and round – or rather, I think that she spun me.